An Elegant Faceted Edge Octagon Crystal Octagon Jewel Edge Trophy Award mounted on Clear Crystal Base. Personalized with the message of your choice, it will surely become a treasured keepsake for the recipient. Imagine the expression of the person when they see their name on one of these impressive awards. Engraving is laser etched and a velvet lined presentation gift box is included. An Elegant Beveled Edge Crystal Octagon Rectangle Trophy Award with Matching Clear Crystal Base. Personalized with the message of your choice, it will surely become a treasured keepsake for the recipient. Imagine the expression of the person when they see their name on one of these impressive awards. Engraving is laser etched and a velvet lined presentation gift box is included. These Corporate Crystal Octagon awards come with a matching rectangle crystal base and are ideal to recognize the ultimate in achievement. A unique cut pattern that highlights the crystal adds another dimension to these awards. With a choice of 3 height sizes, 5 1/2", 6 1/2", or 7" allows for plenty of area for your personalization needs, assuring that these crystal octagon awards will be a hit. An Oval Faceted Crystal Award on Matching Crystal Base. Personalized with the message of your choice, it will surely become a treasured keepsake for the recipient. Imagine the expression of the person when they see their name on one of these impressive awards. Engraving is laser etched and a velvet lined presentation gift box is included. A Clear Crystal Oval Memento Trophy Award on matching Clear Crystal Base. Personalized with the message of your choice, it will surely become a treasured keepsake for the recipient. Imagine the expression of the person when they see their name on one of these impressive awards. Engraving is laser etched and a velvet lined presentation gift box is included. A Faceted Crystal Oval With Scalloped Edge Trophy Award on Crystal Base. Personalized with the message of your choice, it will surely become a treasured keepsake for the recipient. Imagine the expression of the person when they see their name on one of these impressive awards. Engraving is laser etched and a velvet lined presentation gift box is included. An Elegant Peak Monument Trophy Award Reflective Crystal Award. Personalized with the message of your choice, it will surely become a treasured keepsake for the recipient. Imagine the expression of the person when they see their name on one of these impressive awards. Engraving is laser etched and a velvet lined presentation gift box is included. These Corporate Crystal Faceted Plates come with a matching crystal base and are ideal to recognize the ultimate in achievement. The faceting along the outside of the plate leaves plenty of room in the middle for your personalization needs. Engraving is laser etched and a velvet lined presentation gift box is included. An Elegant Two Piece Crystal Plate and matching Clear Crystal Base with Diamond Faceted Edges around Edge of Plate. Personalized with the message of your choice, it will surely become a treasured keepsake for the recipient. Imagine the expression of the person when they see their name on one of these impressive awards. Engraving is laser etched and a velvet lined presentation gift box is included. 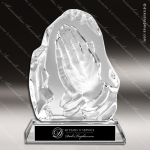 An Elegant Sculpted Praying Hands Glass Award with matching Clear Crystal Base. Personalized with the message of your choice, it will surely become a treasured keepsake for the recipient. Imagine the expression of the person when they see their name on one of these impressive awards. Engraving is laser etched and a velvet lined presentation gift box is included.